In the digital age of NHL stat-keeping, player, coaches and franchise milestones are tracked and recognized like never before. Through that wealth of achievements, only a handful of those truly stand out to the hockey community at large years later. Even fewer air so many times on highlight reels and commercials that the images become ingrained for fans who weren’t even alive to watch the game. 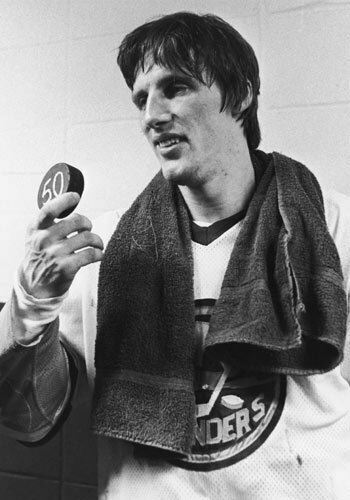 Mike Bossy became the second player in NHL hisrtory to score 50 goals in 50 games. Click here to watch highlight video. The clock was winding down on the Islanders-Nordiques game on Jan. 24, 1981. With five minutes remaining the score was tied at four and Mike Bossy sat on the bench, wondering what he would tell the media after the game. He had 48 goals in 49 and 2/3 games, a respectable feat itself, but he had promised the elusive 50 goals in 50 games, something that hadn’t been done in 36 years. He stopped thinking about it, hopped over the boards, and then instinct kicked in. With just over four minutes left, he skated in front of the Nordiques goal and backhanded a feed from Stefan Persson passed Ron Grahame. That held up as the game-winner, but with two and a half minutes to go, a milestone was to be had. Bossy was posted by the left faceoff dot. He received a pass from Bryan Trottier and immediately let it go. When the twine bulged, Bossy became only the second player in history, after Maurice “Rocket” Richard, to score 50 goals in 50 games. Three more players have since joined the club: Brett Hull, Mario Lemieux and Wayne Gretzky. That’s pretty elite company. He appreciates that people still approach him and tell him that they were there during the game or that they remember the goal, over 30 years later. As for his personal accolades, Bossy says that going 50 in 50 is a close second on his formidable resume. The only thing that could top scoring 50 goals in 50 games - scoring 50 goals in nine straight seasons. As for the milestone puck, Bossy still keeps it in a safe place. The current whereabouts are unknown to all but its owner, but no one will forget its last public appearance: Nassau Coliseum, 31 years ago today.